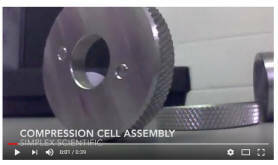 The Microflow cell provides chemical resistance analysis of liquid materials. These inserts are design to work with both the Micro-Oven and the Nano-Oven. Contact Simplex for custom sampling options. Polished Stainless Steel which can be used with/without a window for reflectance of powders, liquides or gels.